It's time to link up with Melissa and Shanna again for March's ALYoF goal setting. I've left it till the last minute again, mainly as I just couldn't decide what to set as my goal. I could have settled on one of the three birthday cushions I started last week or the nursing cushion for Benji which I really would like to make before I finish breastfeeding but something's been nagging me. I have this really, really strong urge to quilt. I haven't touched the frame since the end of September/early October (that's nearly SIX months ago!!!!) when I finished quilting Millie's quilt. As soon as I'd finished Millie's quilt I loaded my Kaffe Snowball quilt. I've just realised that I never took a picture of this as a completed quilt top with borders attached so instead you can have an insight into what my kitchen looks like when I'm sewing. I already had a quilting pattern in mind and was raring to go but somehow never got around to it. So this month I'm going to ignore the bee blocks (at least until this is done) and some kids will have to wait a little longer for their birthday pressies and whilst I just enjoy getting reacquainted with my frame. Hopefully I'll manage to get the quilting finished before the end of the month as I might decide to give this to my brother on his thirtieth next month - I have the binding ready to go - surely nineteen days is enough to bind a quilt? Good luck with the quilting, look forward to seeing it finished! 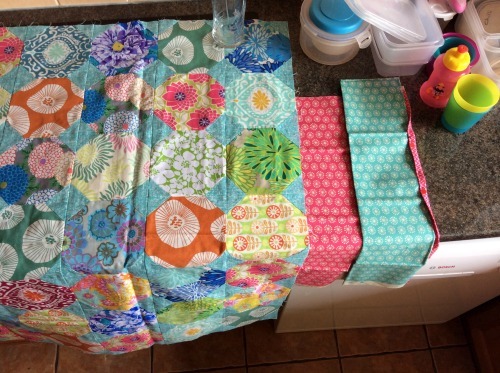 What a great plan to starting using your frame again, I'm sure you'll be making that top into a wonderful quilt! I usually name a post the first phrase that comes to mind... when I finally get a post written that is!